It’s off to the dark and dreary streets of Gotham City we go as Bruce Wayne takes up his alias as Batman once again to continue his fight against the criminals that are plaguing the city, and you’ll be rewarded for every one of The Joker’s associates that he can prevent from escaping jail before witnessing a dramatic showdown between the pair! The Batman slot machine is part of an action-packed DC Comics series of slots released by NextGen Gaming that includes the Green Lantern slot machine and The Flash Velocity slot machine, and it consists of the same setup as it is played across 5x4 reels and offers 50 fixed paylines. Like the other DC Comics slots there is also the Bonus Bet feature, so if you’re playing with it active (which I’d certainly recommend so that you can access the Descent into Madness feature) you can spin the reels from 60p up to £120 per spin in contrast to the 50p to £100 stakes you can play without it active, which sees an additional Batman Wild symbol added to the second, third and fourth reels and offers you the opportunity to descend into madness in a sensational bonus game – it’s well worth the additional cost! Batman himself is the wild symbol and appears on the second, third and fourth reels only with the power to substitute for all but the Bonus and Scatter symbols, plus when he is part of a winning combination the prize is doubled in the base game. The iconic Bat signal is used for both the Bonus and Scatter symbols. His arch nemesis The Joker appears with his trademark menacing smile as he clutches a playing card, while Commissioner Gordon is there for advice, and you can also jump into the Batmobile, ride the Batcycle, a beaming spotlight, a fake gun, Baterangs, acid flowers, and a joker playing card. The Descent into Madness bonus feature is only accessible when you are playing with Bonus Bet activated and can be triggered simply by landing three or more of the Bonus symbols on the reels at any one time. You’ll then find yourself transported to Blackgate Penitentiary where many associates of the Joker’s gang are attempting to break out of jail and make an escape to unleash more crime on the city. It’s up to you to take on the role of Batman and use your Baterang to strike the villains and inflict injuries so painful that they are stopped in their tracks unable to move anywhere, with cash prizes awarded for each strike that is inflicted. With his allies all crippled it sets up a dramatic showdown with The Joker who is also trying to flee from the four walls that he is holed up in every day, but he is much tougher than the rest of his cronies and it will take knocking him down three times to ensure he can’t make an escape – a feat that will see you rewarded with up to 100x your stake for preventing him from unleashing chaos on the streets! If you’re a fan of the Batman comics or have watched the numerous movies, you will know that Commissioner Gordon is one of Batman’s most trusted allies therefore he is always a welcome face on the reels, and for more reasons than being a friendly face to look at. Whenever Commissioner Gordon appears on the first reel alongside the Bat Signal on the fifth reel, or vice-versa, you will be armed with three re-spins – a feat that actually occurs pretty frequently which was surprising due to how lucrative it is. This sees a trio of stacked Wild symbols occupy the second, third and fourth reels as the first and fifth are respun, plus all winning combinations created come with a 2x multiplier! 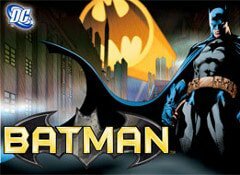 If you’re a fan of the Batman comic books you are going to love NextGen Gaming’s Batman slot machine as the reels have been designed brilliantly with fantastic animations and sounds accompanying them, however if you are like me and prefer movies you will prefer The Dark Knight slot machine from Microgaming which is based on the blockbuster and offers the opportunity to win a life changing progressive jackpot!